Not too long ago we saw what happens when a gun and tool enthusiast combines both of his passions; what he came up with was a Glock that was modded to look like a DeWalt 12V Max Drill. This time around we have the flip side to the coin. Instead of a gun made to look like a tool, we have a tool that has been designed to look like a gun. 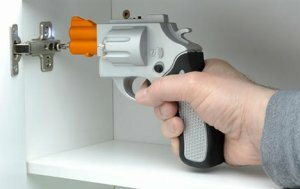 This compact drill "gun" revolver packs 3.6-volts of heat, and being that it is a revolver, it has six chambers that each hold a different bit tip. This is not really a tool for jobsite use, but you can use it to play a prank the next time someone asks to barrow your drill.